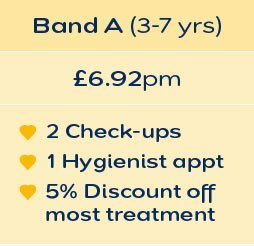 For the best value dental care at WeLoveTeeth, nothing beats Denplan. It’s less expensive than paying-as-you-go, spreads the cost of treatment and avoids unexpected bills. You will also receive at least 5% discount on any treatment that falls outside your plan and special off ers such as 20% off teeth whitening. 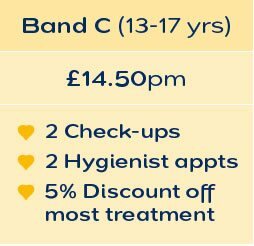 For patients considering orthodontic or cosmetic care, joining a plan could save hundreds of pounds. With Denplan you benefi t from Worldwide Dental Insurance, Emergency Dental Treatment Cover and even a Dental Emergency Helpline. So even if you are a thousand miles from WeLoveTeeth you won’t have to worry about receiving dental care. 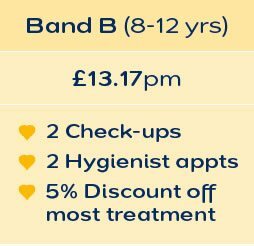 Regular check-ups, hygiene appointments and many other benefits for a low monthly fee. A comprehensive plan that covers most treatment for a simple monthly fee. After an oral health assessment your dentist will let you know which category is appropriate. Regular check-ups, hygiene appointments as they grow up and important health education. 1. Denplan Supplementary Insurance costs 60p per month and is included in every plan’s price. You have the option not to take cover. Please refer to Denplan’s printed and online literature for full terms and conditions. Insurance specific details can be found in Denplan’s Supplementary Insurance Policy. 2. Cover is towards the cost of treatment if you have a dental injury. 3. Covers temporary emergency treatemet in the UK when you are more than 40 miles away from WeLoveTeeth. A member of our team will outline the benefits of each plan and answer any questions that you have. Your oral health will then be assesed by having a check-up with one of our dentists. The fee is £55 for adults and £24 (3-12 years) or £32 (13-17 years) for children. If you are happy to proceed and meet the clinical criteria for the plan of your choice, an application form is completed and sent to Denplan. Following approval you can book your first appointment on Denplan and start enjoying the convenience and piece of mind that all of our plans offer. Please note that Denplan discounts cannot be added to any existing WeLoveTeeth promotion. If Membership is cancelled within 12 months, any discount received must be paid to WeLoveTeeth. Membership at a private dental practice is a really good way to protect your teeth, gums and overall health in the long term for less. With regular maintenance your teeth are unlikely to need significant work like major restorations involving crowns and bridges or dental implants, and you’ll be paying less for that maintenance. 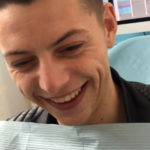 It could be the best solution for you if you’re a nervous patient in Surrey or if you’re simply looking for a Weybridge dental practice that you can trust to care for your family’s teeth for life. The savings over a few years for multiple family members will be significant – just look at our equivalent prices below.